First just let go of the thought, myth or idea that only Scottish people can or should wear kitls and play bagpipes. It's not true. Nor does being Scottish predispose someone to being a good piper. Pipers are made, not born. Those born into families with pipers in them definitely have an advantage, but the pipes are not as scary as one might think, nor are they a novelty to be dismissed by other musicians - a folk instruemnt, yes, but a difficult one. I have heard countless stories of the quintessential "musician who can play whatever instrument he picks up" trying bagpipes on a whim, only to be taken aback by the shear strength, endurance, and physical coordination it takes just to keep them going. I have also had the experience of feeling "dissed" by other musicians who are comlpetely ignorant of the fact that piping requires a lot of skill and practice, bagpipes do indeed have to be tuned (several times per practice or performance), some pipe music has a great deal of complexity in form and execution. Another little known thing about the bagpipe is that it is not distinctly Scottish. The Scottish pipe is formally known as the Great Highland Bagpipe and is actually predated by Irish bagpipes, as well as many other European and eastern varieties. The Scots, being Scots, decided to make a really big, really loud bagpipe with three drones. And the reason the Scottish pipes are so prevalent the world over is due to British imperialsm. As the English colonized the world they took their Scottish regiments and Scottish bagpipes with them. But before the bagpipe was a part of the British military it was for hundreds of years a local folk instrument. 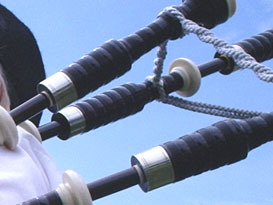 The general mythology is that after the battle of Culloden in 1748, the pipes, which had stirred the Scottish troops to arms were declared a weapon of war and subsequently banned (the only musical instrument ever lawfully decalred a weapon), and the piper who had wielded them in that battle was executed. The piper was executed, but the pipes remained a part of Scottish life in the Highlands. The English military of the Victorian era found kilts and pipes a good motivator for Scottish regiments and groups of elitists formed a sort of artificial piping/Highland culture which remains even now. Part of the pretense was to "save" an art that was endangered, by standardizing it. In some ways piping itself flourished from this, but in other ways the older and more fluid musical forms suffered. Many of those in charge of the early piping societies and competitions were priviledged amateurs who set arbitrary standards which have affected the music to date. Now piobaireachd (pron. "pea-brock"), the great old music of the Highland pipes, is thought - mistakenly - to be a strange, difficult and inaccessible form. Bagpipes are thought to have originated in the Middle East as offshoots of simple reed pipes. The practice chanter reminds many poeple of a snake charmer's flute, becasue it is a similar simple capped reed instrument. In fact in the Middle East, they really dig Scottish bagpipes. The odd scale and the sound of the chanter, reminiscent of the shawm (loud double reed predecessor to the oboe) appeals to their tastes and accomodates much of their music. Granted, they tune their chanters a little toward the odd side, while the modern Scottish chanter leans more toward a western tuning which originated in Europe. On that note - no pun intended - pipe music is written in the key of "A." But the scale - consisting of only nine notes (low G to high A) - has a flat G. You music people out there would call this a mixolydian mode. If that means nothing to you, don't worry about it. The flat G causes the "A" scale of the bagpipe to be fairly unusual sounding, and a lot of tunes in the key of A don't have a leading tone because there is not one in the chanter scale. If you want a more normal sounding scale, the key of D works very well on the pipes, since it has the correct number of sharp tones. The only trouble then is the limited range of the pipes. Some tunes seem to have been made for the pipes, like Amazing Grace, but others are hard to arrange, and many tunes are impossible to arrange for the pipes with any satisfactory result. Not that people have not tried it. A perfect case-in-point is the tune "Dixie," very popular here in the South, but it sounds very odd on the pipes. It has to change octaves and keys so many times as to be rendered almost unrecognizable. These odd key shifts and note substitutions, if used in abundance can make it sound to the layman as if the piper does not know how to play the tune and is making a lot of mistakes, so these tunes are probably better avoided, though there will likely always be arguments about it. A bagpipe consists of three drones - two tenors and a bass - and the chanter, which is the melody pipe, all attached to a bag, which can be a synthetic material, or the more traditional leather. Each pipe contains a reed which vibrates when the air passes over it. The chanter reed is double-bladed much like an oboe or a bassoon. But it - like the drones - is out of direct control of the piper. The piper fills the bag through the blowstick, a pipe with a mouthpiece and a non-return valve that keeps air from coming back out of the bag. When the bag is full, the piper "strikes in" the drones by lightly hitting the bag and blowing into it at the same time. Then he tucks the bag under his arm with the drones going and adds a little more pressure to start the chanter. The piper must continue filling the bag with air while he is playing, keeping cosntant pressure on the bag with the left arm. The drones, when correctly tuned, all three produce the same note as "A" on the chanter. The "A" is not a true concert A, but is actaually a few cycles sharp of B-flat, so when bagpipes are played with other instruments the music must be transposed properly as to avoid any musical train wrecks. This is also why it is a good idea for pipers to understand basic music theory, so that they can work with other muscians and educate them on the nature of the pipes as they relate to the rest of music. Part of relating to other musicians is a love for excellence in, not only playing, but also tuning. A good-sounding bagpipe will be tuned very precisely. The chanter must be tuned to itself. And the way chanters are made causes them to react a little differently with each different make of reed. So a make of read that works well with the particular type of chanter must be found. Once the reed is selected it has to be balanced so that high A and low A make an octave. Then all the other notes must be tuned by adding little bits of tape slightly coverning the tops of the appropriate chanter holes to flatten the notes which ae a bit sharp. Once the chanter is tuned the drones are tuned to the As. This is done by slightly lengthening or shortening the drones accordingly with the tuning slides. Hopefully the basic tuning of the drones has already been accomplished by setting the reeds properly. If the reeds are set right, the pipe will sound great while taking as little air as possible. Another phenomenon of how pipe chanters are made is that there is not a set "concert pitch." One band might play a chanter/reed combination that yields a pitch of A-476, while another plays at A-479. A solo player might have an old chanter that plays at A-468. To the chagrin of some traditionalists, the preferred pitch of pipe bands is gradually creeping higher. Some world-class bands have even wieghed in at a whopping A-480. Might as well call it "B" at that point, but it is called "A" because that is how it is noted in the music. Another thing that will be noticed in bagpipe notation is a lot of "little" notes. These are called "gracings" or "embellishments." Any Baroque keyboardist will know about them. They are very short notes used as a means of separating notes and adding articulation in the tunes. Gracenotes are neccessary in piping since the chanter is getting a constant supply of air. There are no rests, stops or tonguing which other woodwind players can use to add musical expression. Once a bagpipe starts, it doesn't stop until the end of the tune or set. This is a challenging new way to think about music. The illusion of rests can be created by using certain combinations of notes and gracings, and bagpipe composers are always coming up with new ways to immitate other styles. Another musical element pipers don't get is dynamics. A Scottish bagpipe has two volumes: "loud" and "off." This can present a problem when pipers want to practice. No matter where you go, everyone within a mile can hear you. Pracitcing in an apartment is almost out of the question, and no matter where you find to pracitce, it can be unnerving to know that everyone can hear you. Unlike many other musicians, pipers do not get to make all their mistakes in private. This leads to the whole issue of learning to play. The key is the practice chanter. Even seasoned pipers can familiarize themselves with tunes and exercises on the practice chanter. This is a much smaller, quieter instrument. It is also the instrument that beginners start to learn on. The first six months to a year of the piping career is spent playing just the practice chanter, though attaching the chanter to a bag called a goose and playing it like a bgpipe is a recommended way to begin to make the transition to the pipes. Another great thing about a practice chanter is that it is much less expensive than a bagpipe, so people who are not sure if they really want to play the pipes can give it a try for little investment. And there will always be a piper or instructor who is willing to let a beginner have a shot at the big pipes to get a feel for them and see what he or she is getting into if a purchase is made. Once the pipes are bought, it can be a good idea to just play the drones in order to begin to understand the pressure and coordination that is needed to keep them going steady. It's also a good time to start learning how to tune them to each other. Later the chanter can be added (usually with only one drone at first) and single notes and scales can be attempted. After about five or six tunes are memorized on the practice chanter or goose it's time to try them on the pipes. Most people start with Amazing Grace or Scots Wha' Hae, both very simple, and very popular, tunes. This is a long slow process and when you want to be a good piper, it can seem to take forever, but it's worth it, and true proficiency can take many years to gain. And despite the conveneince of the practice chanter, practice on the actual bagpipe is essential to improvement. Some professional pipers use their practice chanters very little, but at the beginning stages the practice chanter is a must and it always remains part of a piper's equipment. Another must is a piping instructor. Some areas do not have a wealth of bagpipe instructors. One of the best places to look is the closest pipe band. There should be several pipers in the group who are capable of beginning isntruction. When available instruction is exhausted, then the serious student has options, such as periodic travel or lessons over the phone or internet - all options which have worked well for pipers in more remote locations or areas where piping is not a prevalent activity. When beginning the bagpipes a student - expecially an adult or someone with prior musical experience - must be willing to listen and do what the teacher asks, no matter how illogical it might seem. A lot of preconceived musical notions must be thrown out and a whole new way of thinking has to be adopted in order to make progress. If there is anyone out there considering learning to play the bagpipes, it is very important to talk to the right person before going out and buying anything. A lot of people have been discouraged and disappointed by ending up with the a substandard instrument, which can be a waste of time and money, as well as a real damper on enthusiasm. These days, a good set of bagpipes will be made of African blackwood and will run anywhere from $900 to $1500, minus all the external bells and whistles and expensive solo chanter. A student set with very little woodwork or a plastic set (yes you heard right) can cost as little as $700. But even if you pay a lot it doesn't guarantee that you are getting something good, so consulting with someone who knows what to buy and where to buy is very important. Don't go to a music store. It's a sure bet that none of the people there wil have any idea what to order, and neither will their suppliers. In fact, don't even buy a practice chanter until you talk to someone. Like pipes, PCs come in many varieties ranging from very nice expensive ones to poorly made, overpriced objects imported from Pakistan.